UPDATE 11 AUGUST 2012: I've made a major overhaul to this upload, adding improvements to the original items such as recolourability and removing the need for the player to have to set all the colours of each eye to white first before using it, as was the 'old way' of using contacts. I've also added one completely new eye. If you've downloaded the old versions of these and would like the 'new improved' versions, please re-download! 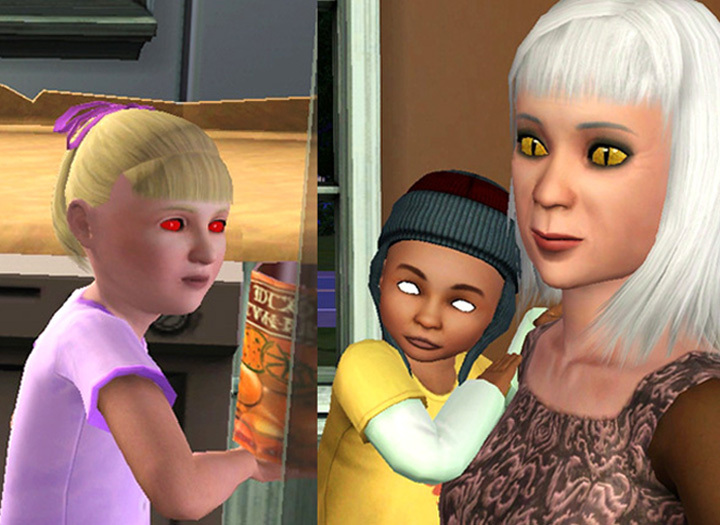 Thanks to Wintermuteai1's great tutorial (http://modthesims.info/showthread.php?t=358457 ) and the research done by Xanathon (http://www.modthesims.info/showthre...#startcomments), we can now have non-default eyes as contacts cloned from the Costume Makeup item. So I had to rush right off and make some Sci-Fi style ones for myself, and I hope you'll find these useful for your own Sci-Fi or fantasy creations too. They are for both genders and all ages, Toddler to Elder. 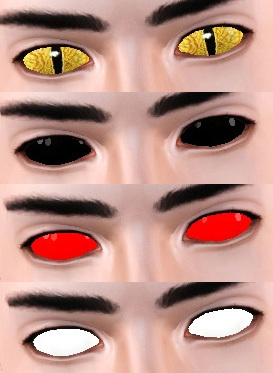 They are all found in the Costume Makeup section in CAS, and each will have a thumbnail picture showing which eye it is. 1. Eyes that are one solid colour. My old version came as three separate package files, white, black and red. The new version is one file with three presets for white, black, and red. 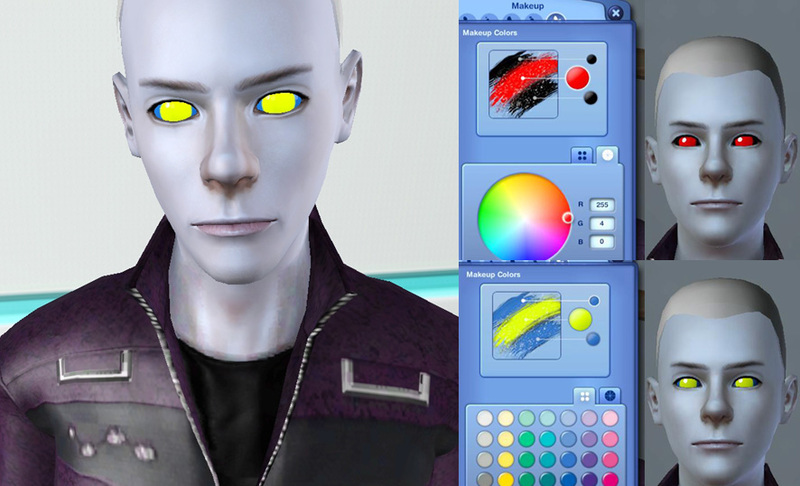 The white preset is fully recolourable, so your sim can have solid colour eyes of any colour (or pattern) you like, or you can choose one of the other two presets to just instantly give your sim solid black eyes (such as my alien guy below) or red eyes without having to fiddle with CaST settings. 2. Lizard eyes. 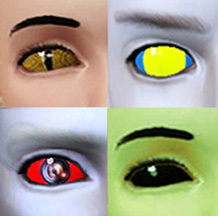 Good for humanoid lizardmen and other scaly creatures, such as my Lounge Lizard guy below (snout face made, although not very successfully, with the aid of a facial slider range multiplier). These are by default a natural gold-ish colour, not 100% recolourable but can be tinted in CAS to achieve other colours. 3. 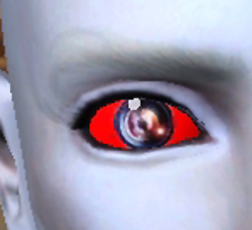 Cyber Camera Eyes, a dramatic-looking Sci-Fi eye consisting of photorealistic camera lens pupils/irises on a laser red sclera. Great for cyborgs, robots, aliens, and similar scary non-humans. These are preset as depicted below and not really recolourable, although they can be over-tinted a bit. 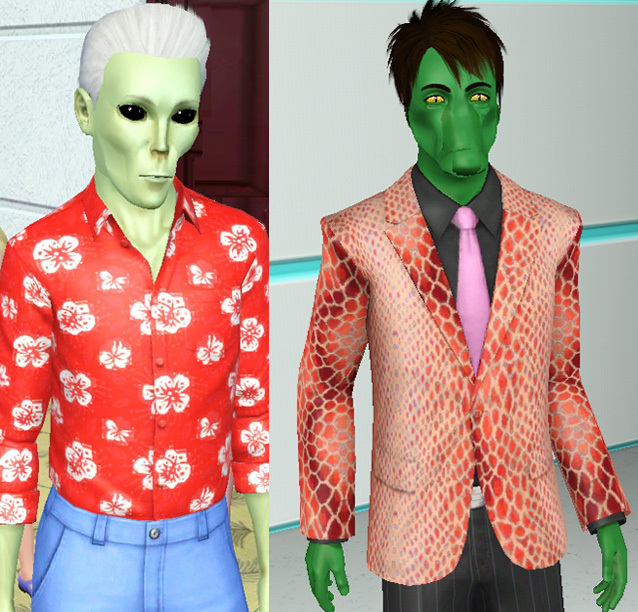 Thank you for looking, hope you'll find these useful for your Sci Fi sims! All four eyes are in one zip file together. Just unzip the zip file and copy the .package file(s) of your choice to your Mods\Packages folder. Each eye is in its own separate package, so you can choose whether to install all of them or just one or two. All eyes were made with CAS Texture Unitool. Tags: #eyes, #contacts, #Sci-Fi, #science fiction, #science, #alien, #robot, #cyborg, #sci fi, #fantasy, #cyber, #"fantasy eyes"